Browned butter. Peanut butter. 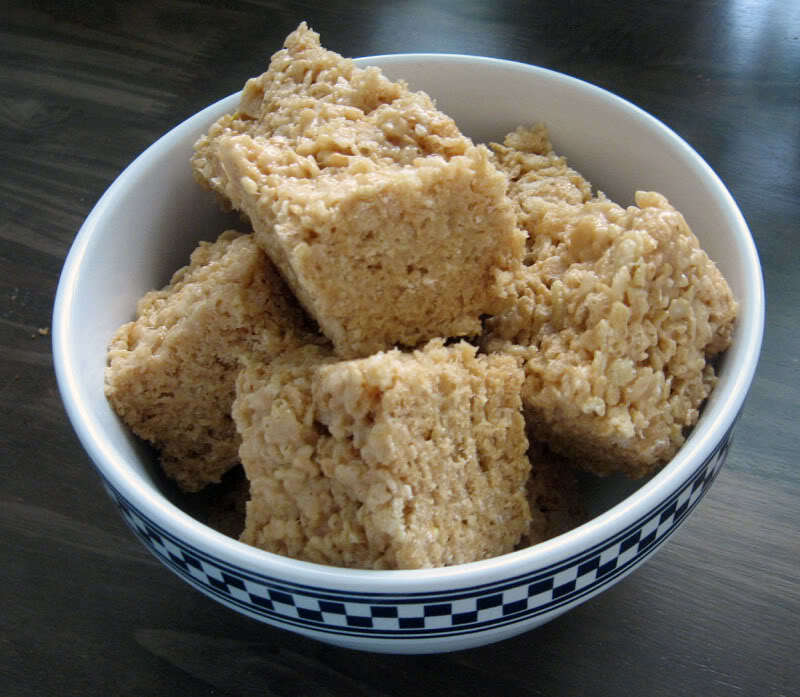 Rice Krispies. A match made in food heaven, for sure. Because if you can't like these, I'm not sure what's wrong with you. Oh, you're allergic to nuts? Well, fine. Then you can just make these without the peanut butter, like I've done in the past, and they'll still be perfectly yummy. But if I had to choose? I'd probably pick the peanut butter version. Because I'm kind of in love with peanut butter. And there's nothing wrong with that. Nope! Also? Rice krispy treats are really just one of the easiest things to make around. For real. If you need a quick little something to take on a picnic, for example, these would be easy and yummy. 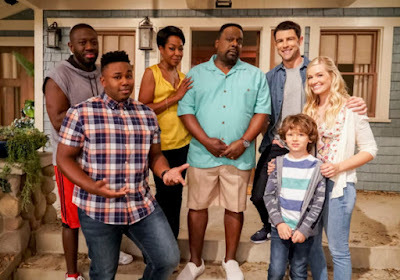 And easy in the kitchen is everyone's favorite. Brown the butter in a large saucepan. If you've never browned butter before, it's pretty easy. Melt it in the saucepan on medium heat until it starts to foam up, it will eventually calm down and start to throw a nutty aroma up at your face. Once it's doing that, add in your peanut butter, salt, and marshmallows and stir them around and around and around until they're all melted into a nice smooth gooeyness. 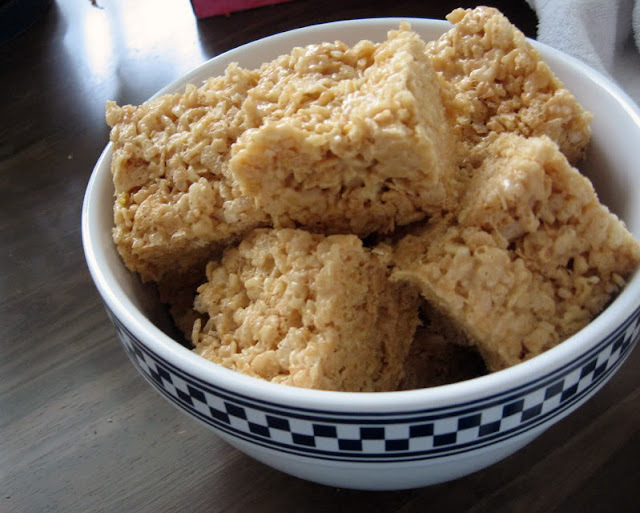 Turn off the heat and add in your rice krispies, mixing around with a wooden spoon until they are well coated in the peanut butter marshmallows. Dump that into a buttered 8 x8 inch pan and press down with some butter or cooking-spray soaked fingers. Let them set up for a bit, then cut 'em up into some bars and enjoy! As you can see, they fill up that 8x8 pan to the brim! 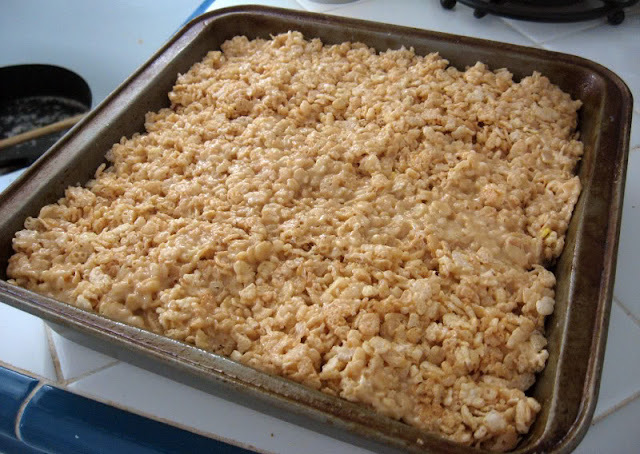 If you want thinner krispies, you can always use a larger pan. The peanut butter is just the right amount in these. Not overwhelming, but with just the right amount of "hey, that's peanut butter!"